President Michael D Higgins has said the Chernobyl disaster 31 years ago exposed the vulnerability of humanity and the environment. The plant in the north of former Soviet Ukraine exploded in 1986 after a safety test went wrong at 1.23am on 26 April. Around 30 people were killed on site and several thousand more are feared to have died in the years that followed from radiation poisoning across Ukraine as well as its northern neighbour Belarus and Russia to the east. 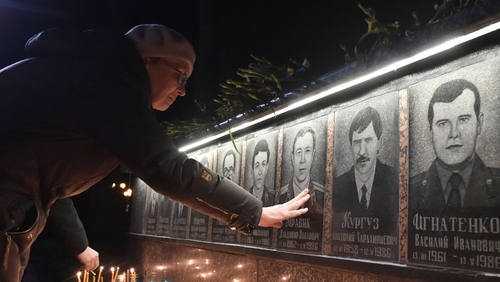 The exact number of victims remains a subject of intense debate because the Soviet authorities kept most of the information about the disaster hidden. Hundreds of thousands of people were evacuated from the area around the disaster site and an exclusion zone was set up that has now become a ghostly uninhabited region. In a statement, President Higgins said Ireland was one of the first countries to respond to the disaster and paid tribute to Aid Roche's Chernobyl Children International group, which "has become one of the leading advocates for the support of children" affected by the disaster. Last year, on the 30th anniversary, Ms Roche called on the UN to formally announce 26 April as International Chernobyl Disaster Remembrance Day. President Higgins said the long shadow caused by the nuclear disaster "is a constant reminder to the world to consider carefully the ongoing impact of nuclear power, to reflect on the lessons of the Chernobyl catastrophe and for all of us to be informed and aware in this nuclear age". The presidents of Ukraine and Belarus toured the site of the Chernobyl plant to mark the anniversary of the disaster. Last year Ukraine placed a mammoth €2.1 billion metal dome over the remnants of the Chernobyl plant in a bid to stop future leaks and ensure the safety of Europeans for future generations. More than 200 tonnes of uranium remain inside the crippled reactor that leaked radiation across three quarters of Europe. "Thirty-one years ago, the worst ecological catastrophe in human history struck the Chernobyl nuclear power plant," Ukrainian Prime Minister Volodymyr Groysman wrote on Facebook. "Thank you to the heroes who, at the expense of their own lives and health, protected us from the horrible consequences of this tragedy." About 600,000 people who became known as "liquidators" - mostly emergency workers and state employees - were dispatched with little or no protective gear to help clean up the aftermath of the disaster. A 2005 United Nations report estimated that "up to 4,000" people could eventually perish from the invisible poison in Ukraine and neighbouring Russia and Belarus. The Greenpeace environmental group the following year issued its own study estimating that 100,000 had already lost their lives. Fears that a structure hastily built over the stricken reactor was cracking saw more than 40 countries pitch in for the creation of the new 25,000-tonne protective steel barrier.